A medical breakthrough of easy and secure exchange patient data! A medical breakthrough: at long last, easy and secure exchange of patient data is at our fingertips! THE HAGUE – Collaboration in the healthcare sector is becoming increasingly important. It is therefore vital that patient data can be easily shared between healthcare providers and with patients themselves. Unfortunately, the multitude of different systems in the healthcare sector has always complicated matters. But that's about to change. The Reinier Haga Group is the first organization to put Zorgplatform (the Care Platform) into use, which enables simple, structured and secure exchange of patient data. The Reinier Haga Group (consisting of Reinier de Graaf Hospital in Delft, Haga Hospital in The Hague and LangeLand Hospital in Zoetermeer) has become the first to put Zorgplatform into action. Using this platform, patient data in the electronic patient file can be shared in a simple, secure and structured manner between healthcare institutions and eHealth solutions such as the FocusCura cVitals app. The introduction of Zorgplatform is a welcome boost to the cabinet's ambition to promote collaboration in the healthcare sector by actively developing ICT standards and making them compulsory. Today, Secretary General Erik Gerritsen talked about this development during a working visit. "The Reinier Haga Group strives to offer its patients the right care in the right place at the right time. To achieve this ambition, it is essential that healthcare is tailored to suit individual patients as much as possible, increasingly making patients the directors of their own care processes. The introduction of a home-measurement app to measure vital statistics such as blood pressure, weight and pulse rate will greatly facilitate this. In addition, the availability of a patient file to our doctors and nurses is vitally important," explains ICT manager Marcel Slingerland. "An increasing amount of the patient data we use is now obtained from other healthcare organizations and innovative apps used by patients at home. Zorgplatform has allowed us to tap in to these rich wells of data. A long-held desire among doctors and nurses is to have a total picture of each individual patient's health. This is often impossible as the data required is locked away in a maze of separate systems. "We specially developed Zorgplatform to solve this problem simply and securely," explains ChipSoft's Remko Nienhuis. "Zorgplatform allows data to be shared with the hospital's electronic patient file in a standard manner with the aid of the Healthcare Information Building Blocks (Zorg Informatie Bouwstenen or ZIBs) developed by the government. In this way, hospital EPFs can connect to other patient files and even with other innovative healthcare technologies." FocusCura is the first to have its cVitals app connected to Zorgplatform. This allows medical specialists to prescribe 'cVitals home measurements' directly via the electronic medical record (EMR), to access to these home measurements and to receive alerts if any deviations are identified. They can then respond to these alerts, for example, via a video call using FocusCura cContact. Cardiologist Jan Willem Borleffs, who works at the Haga Heart Center at Haga Hospital, is very impressed with the new possibilities. 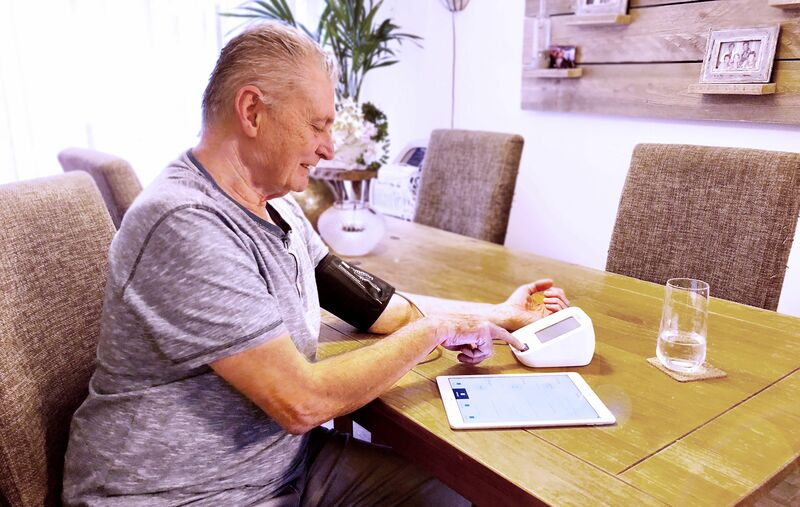 "Last year, we saw exactly how FocusCura's home measurements and video calls can provide vital assistance to patients with heart problems. Patients feel safer and we can take action earlier, which means hospital admission is often prevented." "This new form of care means better check-ups for me and that works really well."Mr. van der Hoeven, a heart patient, agrees. "This new form of care means better check-ups for me and that works really well." To connect more patients to this system, it is vital that these home measurements are integrated into ChipSoft's EMR HiX, as this will prevent a whole separate system from being required simultaneously. "I am very happy that Zorgplatform has made all data available in our EMR," says Borleffs. "This is a key step in gaining acceptance of eHealth."